On 13 June, the Japanese made a naval landing that captured Anqing, which signalled the onset of the Battle of Wuhan. On the southern shore of Yangtze River, the Chinese 9th Military Region stationed one regiment west of Poyang Lake, another regiment was stationed between the line from Jiangxi to Jiujiang. The Japanese 11th Army main force attacked along the southern shore of the River. The Japanese Namita detachment landed in the east of Jiujiang on 23 July. The Chinese defenders tried to resist, but they could not stop the 106th Japanese Division from landing as well and Jiujiang was captured on the 26th. The Namita detachment moved eastward along the river, and landed northeast of Ruichang on 10 August and began laying siege to the city. The defending 3rd Chinese Army (Group?) were reinforced by the 32nd Army Group and resisted. However, when the Japanese 9th Division entered the action, the Chinese defenders were exhausted and Ruichang was eventually captured on the 24th. The 9th Division and the Namita detachment continued to move eastward along the river, while the 27th Division invaded Ruoxi simultaneously. The Chinese 30th Army and the 18th Army resisted along the Ruichang-Wuning Road and the surrounding area, and the situation was in stalemate for months. On 5 October, after the Japanese 27th Division captured Ruoxi, they turned to strike northeast and captured Xintanpu in Hubei on the 18th and began moving toward Dazhi. In the meantime, the Japanese Army and their supporting river fleet that advanced eastward along the River encountered resistance from the defending Chinese 31st Army Company and 32nd Army Group in the west of Ruichang. 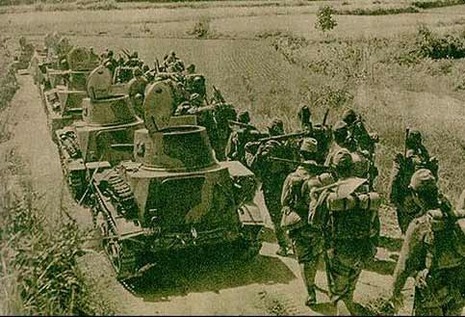 When Matou Town and Fuchikou (in Yangxin County) were captured, the Chinese 2nd Army Group organized 6th, 56th, 75th and 98th along with the 30th Army Group to strengthen the defense of Yangxin region. The battle continued until 22 October when Chinese lost all of Yangxin, Dazhi and Hubei City. The Japanese 9th Division and Namita detachment was now approaching Wuchang. 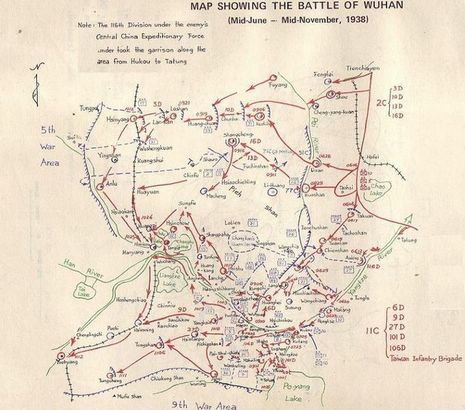 As Henan Province fell under Japanese control, Wuhan became the next defensive objective for the Chinese. Wuhan was the capital city of the Hubei Province, and it was actually consisted of three small cities of Wuchang, Hankou, and Hanyang. It was the second largest Chinese city by population.